Our Source Consulting Group site contains links to third-party Web sites. These linked sites are not under the control of Source Consulting Group, and Source Consulting Group is not responsible for the contents or activities of any linked sites or any link contained in a linked site. Source Consulting Group does not make any warranties, either express or implied, as to the quality, or the content of any such site. This site is presented by Source Consulting Group on an “as is” basis. Though we do our best to uphold the highest and most impeccable standards of content, Source Consulting Group makes no representations or warranties of any kind, express or implied, as to the operation of the site, the information, content, materials or products included on this site. To the full extent permissible by applicable law, Source Consulting Group disclaims all warranties, express or implied, including but not limited to, implied warranties of merchantability and fitness for a particular purpose. Source Consulting Group will not be liable for any damages of any kind arising from the use of this site, including, but not limited to direct, indirect, incidental punitive and consequential damages. 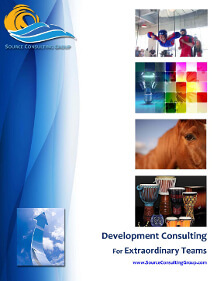 Source Consulting Group is a registered trademark and a service mark of Source Consulting Group. These and the trademarks and service marks of our various services, may not be used in connection with any product or service without the express permission of Source Consulting Group. All contents of this site, including text, graphics, logos and identity devices, button icons, photographic images, audio and video clips, and software, are the property of Source Consulting Group or its content and product suppliers, and is protected by the copyright laws of the United States and by international copyright laws. The design (meaning the layout, arrangement and assembly) of all content elements of this site are the exclusive property of Source Consulting Group, and as such are protected by the copyright laws of the United States and by international copyright laws. This Web site (excluding linked sites) is controlled by Source Consulting Group from within the state of Texas, United States of America. It can be accessed from all fifty (50) states, as well as from other countries around the world. As each of these places has laws that may differ from those of Texas, by accessing this Web site both you and Source Consulting Group agree that the statutes and laws of the state of Texas, without regard to the conflicts of laws principles thereof, will apply to all matters relating to this Web site. You and Source Consulting Group also agree and hereby submit to the exclusive personal jurisdiction and venue of the state or federal courts located in Travis County, Texas, United States of America with respect to such matters.